As a mom, how can you make your life hassle free? That got your attention! You might be having trouble carrying your baby and your things simultaneously while doing errands. This is especially true when you’re making a short trip or running quick errand. Unfortunately, there is no definite solution. But it all starts with a good bag. Yes, a good bag for baby essentials will make your travel less of a hassle. Rather than using a regular backpack or pouch, use a real diaper bag. It has many outer pockets and interior compartments that will keep your things organized and easy to find. You can use the interior compartments with your own system of organizing things. A diaper bag also has straps long enough to hang on your shoulders to keep your hands free. So, what makes a good diaper bag? It should have the functionality you need. It should have enough space not only for baby’s things but also for your things like phone, keys, and wallet so you won’t have to carry a separate bag. It should also have the style that suits your taste and can go with any outfit. 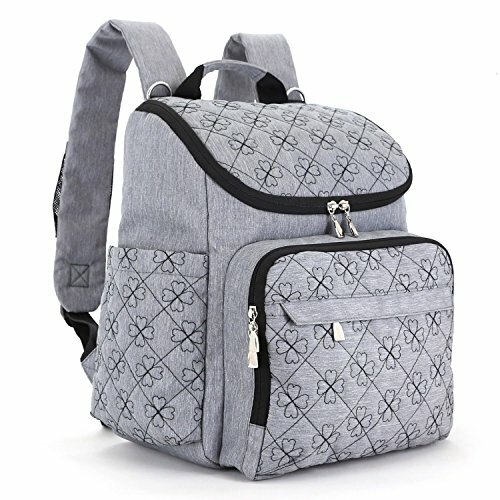 There are hundreds of diaper bags, but not all are of good quality. You need to consider the features, materials, and stitching. To help you choose, we are reviewing one of the best-selling diaper bags today—the Diaper Bag Backpack with Baby Stroller Straps by HYBLOM. It is a backpack-style diaper bag so you can keep your hands free to do other tasks like holding your baby more securely, holding the door, etc. The HYBLOM Diaper Bag Backpack has many pockets including the elastic interior compartments, side pockets for bottle, pocket for phone, zippered pockets, bottle pockets with thermal insulation, and more. The HYBLOM Diaper Bag Backpack is a simple diaper bag that stays true to its functionality. Learn more about it by reading the pros and cons below. There are a lot of things to consider when you become a mother. This includes ensuring your baby feels comfortable and has all his/her needs when going out. It also starts with using a good bag, a real diaper bag to be specific. It has more pockets, is easier to clean, and more convenient than using a regular bag or purse. The HYBLOM Diaper Bag Backpack is a good bag made of durable polyester and nylon. It is easy to clean and has shoulder straps that are adjustable and comfortable. It has a total of 12 pockets including insulated pockets, bottle pocket, zippered pocket, etc. It can accommodate up to 24 liters and weighs 1.6 pounds. This HYBLOM Diaper Bag Backpack is worth the money and can be given as a baby shower gift. It comes with a money-back guarantee to secure your purchase. Make your life less stressful with the Diaper Bag Backpack with Baby Stroller Straps by HYBLOM.